So, let's say you are enjoying a vacation in a foreign country, but the local language sounds like Klingon to you. In other words, you don't understand the locals, and most of them don't understand you either. That makes things a tad complicated, doesn't it? It surely does, but not if you have the latest version of Bing Translator installed on your Windows Phone. What's really cool about the app is that Bing Translator can now be used offline with the download of a language pack. That eliminates the need for a data connection, which could be quite expensive when travelling abroad due to roaming charges. If you have never used Bing Translator before, think of it as the Universal Translator from Star Trek. It can recognize the user's speech and provide an audible translation in a different language. Furthermore, if you capture foreign text with the smartphone's camera, the app will overlay the English translation on top of the foreign text. Sounds cool, doesn't it? 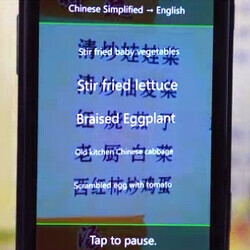 You can get Bing Translator for free from the Windows Phone Marketplace. The languages that it currently supports are English, Spanish, German, French, Italian and Chinese Simplified.